I’ve been obsessed with popcorn for as long as I can remember. I was that girl who’d buy movie theatre popcorn without even going in to see the movie. When I was stuck late working at the office, I’d often break into my stash of microwave popcorn bags hidden under my desk. And the night before our wedding, Anguel and I cranked out batches of homemade popcorn to serve as a late night wedding snack. Yup, was boring as it might sound, popcorn is my favorite thing to eat. Seriously. Next best? Everything bagels. Honestly, it’s hard not to get addicted to anything sprinkled with the magic dust that is “everything bagel spice”. 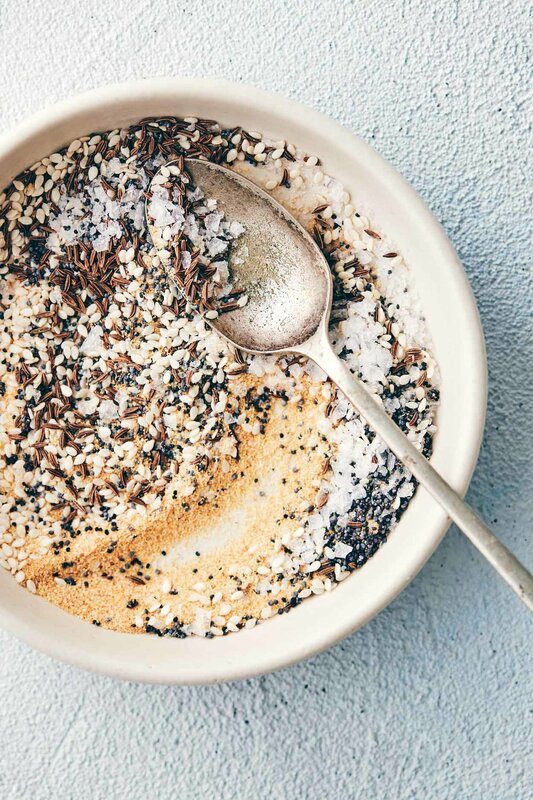 Toasted seeds, aromatic spices, and a hefty pinch of salt. What’s not to love?! Everything bagel spice goes on pretty much anything: avocado toast, hummus, roasted veggies, crackers, the list goes on. But our latest obsession is hands down everything bagel popcorn seasoning. It’s literally everything you could ever want on your popcorn. And then some. Now before you run off and dump a bunch of everything bagel spices onto your popcorn, let’s chat, because that’s not the right way to do it! Personally, we like the popcorn seasonings that actually sticks to your popcorn, not the kind that falls down to the bottom of the bowl. Are we on the same page here? Okay, great, then let’s continue. The trick to an unreal everything bagel popcorn seasoning is to grind up the spices in the blender. That way, some of the seeds and spices turn into a powder - which just so happens to stick magically to some lightly oiled popcorn. It makes all the difference, trust us. It’s similar logic behind “movie theatre popcorn salt” (i.e. the stuff that makes popcorn taste so much more “buttery” than you can ever make it at home). Popcorn salt is a super fine powder that sticks to popcorn much more effectively than larger salt granules, which more often than not fall to the bottom of the bowl. So do yourself a favor and bring out the blender. You may also want to make a double batch, because this seasoning is bound to go fast. A note on the spice mix. We’ve included the recipe for what we think is the best seeds/spice/salt ratio for seasoning popcorn. A quick toast of the sesame and caraway seeds really bring out the flavor. We go pretty light on the salt, given this seasoning will last you 2-3 batches worth, so feel free to add more to your popcorn at the end. We usually find that the spices are plenty, but if you like your popcorn extra salty, then do what you gotta do. We’ve heard lots of people rave about Trader Joe’s Everything Bagel Seasoning, but since Trader Joe’s literally sued (our cute Canadian) Pirate Joe’s out of business, we’re still on that homemade bandwagon. As a shortcut, you could also just blend up your favorite everything spice seasoning and use the powder the same way. Store extra seasoning in a sealed jar and enjoy regularly. Put untoasted sesame seeds and caraway seeds into a dry skillet pan, over medium heat. Stir regularly, until the caraway seeds are fragrant and the sesame seeds are just starting to brown (about 3-4 minutes). Transfer to a blender, alongside granulated garlic, granulated onion, poppy seeds and salt. Blend for 15-30 seconds, just until some of the mixture starts to turn into a powder. You still want to see some of the seeds, so no need to pulverize completely. Store in a sealed jar at room temperature. To use: Put freshly popped popcorn in a large bowl. Slowly drizzle with 2 tablespoons melted butter (or olive oil), stirring vigorously to coat evenly. Sprinkle 3 tablespoons of Everything Bagel Popcorn Seasoning and stir to distribute. Season with extra salt if you need.